The compliance of children’s bones results in unique injury patterns, including plastic deformation, greenstick fractures, and torus fractures. When initial evaluation for fracture is uncertain, obtain repeat radiographs, as it may take 1 to 2 weeks to see callus formation in children. The Ottawa Ankle Rule shows the areas of tenderness to be evaluated in ankle trauma patients to determine the need for imaging.The Ottawa Knee Rule describes criteria for knee trauma patients who are at low risk for clinically significant fracture and do not warrant knee imaging. The Ottawa Ankle Rule shows the areas of tenderness to be evaluated in ankle trauma patients to determine the need for imaging. The Ottawa Ankle Rule was derived to aid in the efficient use of radiography in the acute ankle and midfoot injuries. It has been prospectively validated on multiple occasions in different populations and in both children and adults. Sensitivities for the Ottawa Ankle Rule range from the high 90% to 100% range for “clinically significant” ankle and midfoot fractures. This is defined as a fracture or an avulsion > 3 mm. Specificities for the Ottawa Ankle Rule are approximately 41% for the ankle and 79% for the foot, although the rule is not designed or intended to make a specific diagnosis. The Ottawa Ankle Rule is useful in ruling out fracture (high sensitivity), but does poorly at ruling in fractures (many false positives). Palpate the entire distal 6 cm of the fibula and tibia. Do not overlook the importance of medial malleolar tenderness. “Bearing weight” counts even if the patient limps. Use with caution in patients aged < 18 years. Encourage followup in 5 to 7 days if pain and ability to walk do not improve. Patients who do not have criteria for imaging according to the Ottawa Ankle Rule are highly unlikely to have a clinically significant fracture and do not need plain radiographs. As a result, application of the Ottawa Ankle Rule can reduce the number of unnecessary radiographs by as much as 25% to 30%, improving patient flow in the emergency department (ED). The Ottawa Ankle Rule should be applied to all patients aged ≥ 2 years who have ankle or midfoot pain and/or tenderness in the setting of trauma. » Inability to bear weight both immediately after injury and in the ED. If ankle pain is present and there is tenderness over the posterior 6 cm of the tibia or fibula or the tip of the posterior or lateral malleolus, then an ankle-ray is indicated. If the midfoot pain is present and there is tenderness over the navicular or the base of the fifth metatarsal, then a foot x-ray is indicated. If there is ankle or midfoot pain and the patient is unable to take 4 steps both immediately after the injury and in the ED, then x-ray of the painful area is indicated. Patients who fulfill none of the Ottawa Ankle Rule criteria do not need an ankle or foot x-ray. Patients who fulfill either the foot or ankle criteria need an xray of the respective body part. Many experts would consider this score “one directional.” Because the rule is sensitive and not specific, it provides a clear guide of which patients do not need x-ray if all criteria are met; however, if a patient fails the criteria, the need for x-ray can be left to clinical judgment. The original derivation study in 1992 included nonpregnant patients aged > 18 years who presented to Ottawa civic and general hospitals with a new injury < 10 days old. The initial pilot study included 155 patients, while the full-scale study included 750 patients. Any fracture that was not an avulsion of ≤ 3 mm was considered a clinically significant fracture. This resulted in the initial criteria: aged ≥ 55 years, inability to bear weight immediately after the injury and for 4 steps in the emergency department, or bone tenderness at the posterior edge or tip of either malleolus for the ankle. For the foot, criteria included pain in the midfoot and bone tenderness at the navicular bone, cuboid, or the base of the fifth metatarsal. Further validation and refinement was completed in 1993, through a prospective study of 1032 patients in the validation and refinement phase of the study with 121 clinically significant fractures. The rules were further refined by removing the age cutoff from the ankle rule and cuboid tenderness from the foot rule, but the weight-bearing criterion was added to the foot rule. Sensitivity of the refined rule for both foot and ankle fractures was 100%, and ankle specificity increased to 41% and foot specificity to 79%. An additional 453 patients were then prospectively enrolled in the second phase of the study, where the refined rules were validated, yielding a sensitivity of 100% for both ankle and midfoot fractures. A study of 670 children aged 2 to 16 years at 2 separate sites found that the Ottawa Ankle Rule again had a sensitivity of 100% for both clinically significant ankle and midfoot fractures. This study also found that ankle x-rays could be reduced by 16% and foot x-rays by 29% if the rules were in use at the time of the study. Subsequent meta-analysis of the Ottawa Ankle Rule in children found 12 studies with 3130 patients and 671 fractures, with a pooled sensitivity of 98.5% and an overall reduction in x-ray utilization by 24.8%. Stiell IG, Greenberg GH, McKnight RD, et al. A study to develop clinical decision rules for the use of radiography in acute ankle injuries. Ann Emerg Med. 1992;21(4):384-390. Stiell IG, Greenberg GH, McKnight RD, et al. Decision rules for the use of radiography in acute ankle injuries. Refinement and prospective validation. JAMA. 1993;269(9):1127- 1132. Stiell IG, McKnight RD, Greenberg GH, et al. Implementation of the Ottawa ankle rules. JAMA. 1994;271(11):827- 832. Stiell IG, Wells G, Laupacis A, et al. 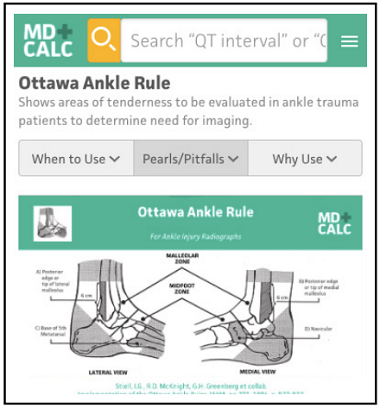 Multicentre trial to introduce the Ottawa ankle rules for use of radiography in acute ankle injuries. BMJ. 1995;311(7005):594-597. Plint AC, Bullock B, Osmond MH, et al. Validation of the Ottawa Ankle Rules in children with ankle injuries. Acad Emerg Med. 1999;6(10):1005-1009. Bachmann LM, Kolb E, Koller MT, et al. Accuracy of Ottawa ankle rules to exclude fractures of the ankle and mid-foot: systematic review. BMJ. 2003;326(7386):417. 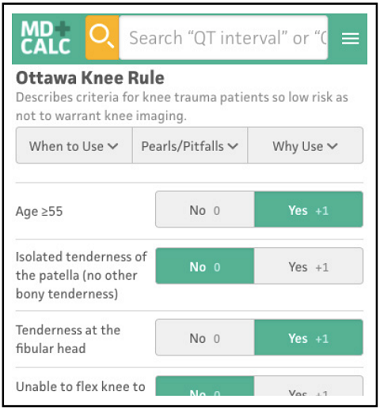 The Ottawa Knee Rule describes criteria for knee trauma patients who are at low risk for clinically significant fracture and do not warrant knee imaging. The Ottawa Knee Rule was derived to aid in the efficient use of radiography in acute knee injuries. Numerous studies found sensitivities for the Ottawa Knee Rule of 98% to 100% for clinically significant knee fractures. One study did find a sensitivity of just 86%. Specificities for the Ottawa Knee Rule typically range from 19% to 50%, although the rule is not designed or intended for specific diagnosis. When the Ottawa Knee Rule is used appropriately, the number of knee x-rays obtained can be reduced by 20% to 30%. The Ottawa Knee Rule is useful in ruling out fracture when negative (high sensitivity), but does poorly at ruling in fractures (many false positives). Tenderness of the patella is significant only if it is an isolated finding. Use only for injuries with a duration of < 7 days. Knee trauma patients who do not have criteria for imaging according to the Ottawa Knee Rule are highly unlikely to have a clinically significant fracture and do not need plain radiographs. As a result, application of the Ottawa Knee Rule can cut down on the number of unnecessary radiographs by 20% to 30%. This has proven to be cost-effective for patients without reducing quality of care (Nichol 1999). The Ottawa Knee Rule should be applied to all patients aged > 2 years who have knee pain and/or tenderness in the setting of trauma. » Inability to bear weight both immediately after the injury and in the emergency department for 4 steps (unable to transfer weight twice onto each lower limb), regardless of limping. Patients who do not have any of the Ottawa Knee Rule criteria present do not need an x-ray. If 1 or more of the conditions are met, then an x-ray is recommended. For significant nonbony injuries, often crutches and a knee immobilizer can be helpful to assist with ambulation. Patients who do not have any of the Ottawa Knee Rule criteria present do not need an x-ray. If 1 or more of the conditions are met, then an x-ray is recommended. Many experts would consider this score “one directional.” Because the rule is sensitive and not specific, it provides a clear guide of which patients do not need x-ray if all criteria are met; however, if a patient fails the criteria, the need for x-ray can be left to clinical judgment. The original derivation study by Stiell et al was done in 1995 and included non-pregnant patients aged > 18 years who presented to Ottawa civic and general hospitals with a new injury < 7 days old as a result of acute blunt trauma to the knee. The study enrolled 1054 subjects, of whom 68 had fractures, with 66 of them deemed to be clinically significant (not a simple avulsion fragment of < 5 mm in breadth without associated complete tendon or ligament disruption). Using recursive-partitioning techniques, the authors derived the 5 variables of their decision rule. If applied to the study population, their decision rule had sensitivity of 100% and specificity of 54% for identifying fractures and would lead to a 28% relative reduction in x-ray utilization. Stiell et al then prospectively validated their decision rule in the same patient population. They performed telephone followup 14 days after the emergency department visit to determine the possibility of a missed fracture. Sensitivity of the decision rule was again 100%, identifying 63 clinically important fractures out of 1096 patients. Specificity was similar to the derivation study at 49%, and there was a 28% relative reduction in x-ray utilization. Stiell et al prospectively implemented the decision rule in different teaching and community emergency departments. They found a relative reduction in x-ray usage of 26.4%, while maintaining a sensitivity of 100% for detecting 58 knee fractures out of 3907 patients, and a specificity of 48%. Moreover, there was a significant reduction in time to discharge and total medical charges in patients who did not get an x-ray. The Ottawa Knee Rule has also been prospectively validated in populations outside of Canada. Two studies, 1 done in Spain and another in the United States, found that the Ottawa Knee Rule had a sensitivity of 100% and 98%, specificity of 52% and 19%, and a reduction in x-ray usage by 49% and 17%. The rule was applied to children aged 2 to 16 years in a prospective, multicenter validation study in 2003. That study found the decision rule to be 100% sensitive in finding 70 fractures out of 750 children, with a specificity of 42.8% and a potential reduction in x-ray usage by 31.2%. The Ottawa Knee Rule has also been compared to the Pittsburgh Decision Rule, another wellvalidated clinical decision rule. A cross-sectional comparison of the 2 rules showed that both had sensitivities of 86%, although the Pittsburgh Decision Rule was significantly more specific. However, this study only included patients aged 18 to 79 years and excluded pediatric patients. Stiell IG, Greenberg GH, Wells GA, et al. Derivation of a decision rule for the use of radiography in acute knee injuries. Ann Emerg Med. 1995;26(10):405-413. Stiell IG, Greenberg GH, Wells GA, et al. Prospective validation of a decision rule for the use of radiography in acute knee injuries. JAMA. 1996;275(8):611-615. Emparanza JI, Aginaga JR. Validation of the Ottawa knee rules. Ann Emerg Med. 2001;38(4):364-368. Steill IG, Wells GA, Hoag RG, et al. Implementation of the Ottawa knee rule for the use of radiography in acute knee injuries. JAMA. 1997;278(23):2075-2079. Bachmann LM, Haberzeth S, Steurer J, et al. The accuracy of the Ottawa knee rule to rule out knee fractures. Ann Intern Med. 2004;140(2):121-124. Nichol G, Stiell IG, Wells GA, et al. An economic analysis of the Ottawa knee rule. Ann Emerg Med. 1999;34(4):438-447. Stiell IG, Wells GA, McKnight RD. Validating the “real” Ottawa knee rule. Ann Emerg Med. 1999;33(2):241-243. Tigges S, Pitts S, Mukundan S Jr, et al. External validation of the Ottawa knee rules in an urban trauma center in the United States. AJR Am J Roentgenol. 1999;172(4):1069- 1071. Bulloch B, Neto G, Plint A, et al. Validation of the Ottawa knee rule in children: A multicenter study. Ann Emerg Med. 2003;42(7):48-55. Describe common and critical pediatric orthopedic injuries and how they typically present. Determine appropriate diagnostic imaging studies to evaluate emergent pediatric orthopedic conditions. Explain current treatment recommendations for pediatric orthopedic emergencies. Date of Original Release: September 1, 2017. Date of most recent review: August 15, 2017. Termination date: September 1, 2020. Other Specialty CME: Included as part of the 4 hours, this CME activity is eligible for 4 Trauma CME credits, subject to your state and institutional requirements. Faculty Disclosure: It is the policy of EB Medicine to ensure objectivity, balance, independence, transparency, and scientific rigor in all CME-sponsored educational activities. All faculty participating in the planning or implementation of a sponsored activity are expected to disclose to the audience any relevant financial relationships and to assist in resolving any conflict of interest that may arise from the relationship. Presenters must also make a meaningful disclosure to the audience of their discussions of unlabeled or unapproved drugs or devices. In compliance with all ACCME Essentials, Standards, and Guidelines, all faculty for this CME activity were asked to complete a full disclosure statement. The information received is as follows: Dr. Lien, Dr. Sanders, Dr. Claudius, Dr. Mishler, and their related parties report no significant financial interest or other relationship with the manufacturer(s) of any commercial product(s) discussed in this educational presentation. Dr. Lee made the following disclosure: royalty payments, UpToDate. Dr. Jagoda made the following disclosures: Consultant, Daiichi Sankyo Inc; Consultant, Pfizer Inc; Consultant, Banyan Biomarkers Inc; Consulting fees, EB Medicine.